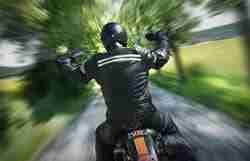 I was riding my motor bike from Rugby in Warwickshire to Wimbledon in South West London. After passing through Milton Keynes I stopped at a set of traffic lights in Luton when I was hit from behind by a car with great force. I was thrown into the air and landed on the road snapping my right elbow. The police were called and an ambulance attended. The car driver admitted he was driving without due care and attention and was prosecuted. At hospital I was diagnosed with a fractured elbow and I have been off work since the accident – three months so far. I have severe pain in my elbow and have had an operation to insert a rod and pins into my arm. Would it be in my interest to pursue a claim for my broken elbow now or at a later date and how much compensation can I recover in a compensation payout for a serious fracture to my elbow? As the car driver has already been prosecuted by the police for driving without due care and attention – there should be no dispute by his motor insurer on the issue of liability of the car driver for your fractured elbow. You have indicated that you suffered a serious fractured elbow, but I suspect you might have other injuries, such as bruising and psychological injury. All symptoms should be properly reported to your GP so that any other injuries that you might have suffered are properly treated and recorded. Click average elbow compensation payouts to see a page I have written setting out the amount of compensation a broken elbow injury can attract. In addition to compensation for pain – you are entitled to a compensation payout for all financial losses, such as: the cost of repair to your motorcycle (or write off value if damaged beyond economic repair), lost income (both past and future), medical expenses, disadvantage on the open labour market, etc. It is best to start a claim now for both fractured elbow personal injury and financial losses – a medical expert will be instructed by your solicitor to properly assess your broken elbow and likely disability. If you would like commence a claim for your motorbike crash elbow fracture injury or to discuss how to make a claim with me in person click motor bike broken elbow claim amounts.